【Multifunctional Camcorder】This video camera max supports 1080P(15FPS) AVI Video Resolution, 24M(6000x4500) JPEG Image Resolution. 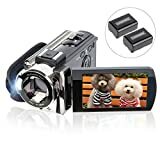 3.0 inch LCD Screen and supports 270°rotation, 16X digital zoom, built-in fill light, Anti-shaking, Face Capture, Beauty Function, Self-timer, Webcam function, Pause function, USB 2.0, TV Output and so on. 【Webcam Video Camera】The digital camera has a Webcam function. When you want to video chat with your friends or family but without a cam on your computer, you may need this function. By connecting the computer with a USB cable, then choose the "PC CAM" mode as a webcam. Please download the software "AMCAP" before using the PC-CAM function, then enter the video interface, and then you can video chat with your friends. 【Pause Function】The camcorder supports the pause function, a good choice for YouTube and Vlogging. You can continue the recording in the same File without restarting a new one. And then you can download the video to your computer through a USB cable and then edit it before uploading to your social media. 【Recording While Charging】The digital camera comes with two 1500mAh 3.7V rechargeable batteries(Model: NP-FV5) One full-charged battery can be sustainably used for 60-90 minutes. Or you can record videos while charging, in this case, you can record long enough videos as you wish and no need to worry about battery drains. The digital camera supports SD card 4GB to 32GB(The SD card is not included in the package, and please format the SD card before using this camera). 【Portable Camcorder】The camcorder is small and lightweight, portable for you to carry around. The camcorder can support external LED light and standard tripod but NOT support external microphone(LED light and tripod are not included in the package). The camcorder supports a one-year warranty. If you have any problems or concerns, please feel free to contact us. Our friendly customer service will do our best to solve your problem within 24 hours.